The book is out on Linus Ullmark. 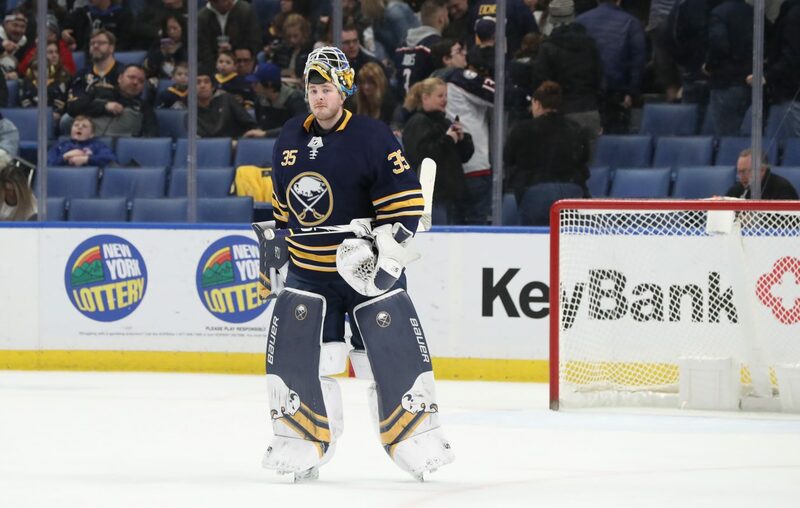 The 25-year-old goalie has proven capable of making difficult saves for the mistake-prone Buffalo Sabres, yet opponents have noticed that Ullmark struggles when tracking the puck on wraparound shots to the opposite post. That weakness was on full display Sunday night in KeyBank Center, when the Columbus Blue Jackets' Nick Foligno used the maneuver to cap a three-goal first period, and the Sabres could not break through offensively in a 4-0 loss. Yet, Ullmark was not the only player responsible for the Sabres' winless streak matching a season-high seven games. They were shut out for the fifth time in 12 games and their defensive mistakes resulted in two Columbus goals. As a result, the Sabres (31-38-3) are 3-17-3 over their last 23 games, including 1-12-1 in their last 13. Columbus (45-30-4) took a one-point lead over Carolina for the first wild-card playoff spot and has outscored opponents 24-4 during its five-game winning streak. Ullmark allowed three goals on 13 shots during the first period, and Josh Anderson pushed the Blue Jackets' lead to 4-0 with a shot between Ullmark's leg pads at 15:31 into the second period. Pierre-Luc Dubois and Oliver Bjorkstrand also scored for Columbus. Jeff Skinner has scored one goal in the Sabres' last 22 games, and Sam Reinhart has two goals over his last 17 games. The Sabres have the fewest points in the NHL since leading the standings Nov. 28. Blue Jackets goalie Sergei Bobrovsky made 38 saves for his league-leading ninth shutout. Opening salvo: The Sabres out-shot the Blue Jackets, 7-1, over the game's first six minutes, only to allow three consecutive goals in the first period. Dubois gave Columbus a 1-0 lead when he tipped Seth Jones' shot past Ullmark at 7:14 into the game. The goal was Dubois' 25th of the season, and the Blue Jackets have six players with at least 25. Uncontested shot: The Blue Jackets pushed the lead to 2-0 when Johan Larsson was not quick enough to close on Bjorkstrand, whose slap shot beat Ullmark at 13:46 into the first period. The Sabres had a plus-5 goal differential in the first period of games this season. 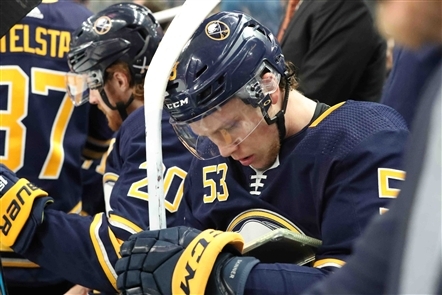 Second-period problem: The Sabres entered the game with a negative-29 goal differential in the second period of games, and they fell behind 4-0 when Anderson skated down the ice on a 2-on-1 and shot the puck between Ullmark's leg pads. Despite trailing by four goals at the second intermission, Buffalo out-shot Columbus, 13-11, during the second period. The Sabres' best scoring chance in the period occurred when Jack Eichel's poor-angle shot went off Bobrovsky's mask. Lineup: Defenseman Jake McCabe returned to the Sabres' lineup after missing 14 games with an upper-body injury. However, Marco Scandella (lower body), Zach Bogosian (lower body), Matt Hunwick (upper body) and Rasmus Ristolainen (illness) were unavailable. Center Evan Rodrigues (upper body) also returned after missing two games, with Jason Pominville and Matt Hunwick healthy scratches. The Blue Jackets were missing defenseman Adam McQuaid. Alternate: With the lineup decimated by injuries and Pominville scratched, McCabe served as an alternate captain. Back-to-back: Buffalo finished the season 6-8-2 on the second night of back-to-backs. Next: The Sabres are not scheduled to practice Monday and will return to the ice for a morning skate Tuesday in preparation for a game against the Nashville Predators.